As promised, Samsung has revealed the results of its investigation into the spate of Galaxy Note 7s that caught on fire. The big takeaway from the investigation is that the phone itself was fine—the quick-charging mechanism inside the phone and the USB-C connector had no role in the exploding phones. Instead, there were a number of problems when it came down to the batteries used inside the phone. Samsung’s investigation included its internal team of 700 engineers and researchers that tested 200,000 devices and more than 30,000 batteries. Samsung also worked with three different groups, UL, Exponent, and TUV Rheinland, who all offered their own independent results. The results come three and a half months after Samsung finally pulled the plug on the Galaxy Note 7 smartphone. Beginning in late August, Galaxy Note 7s started to catch on fire. Samsung initially recalled the phone in September, before resuming production. 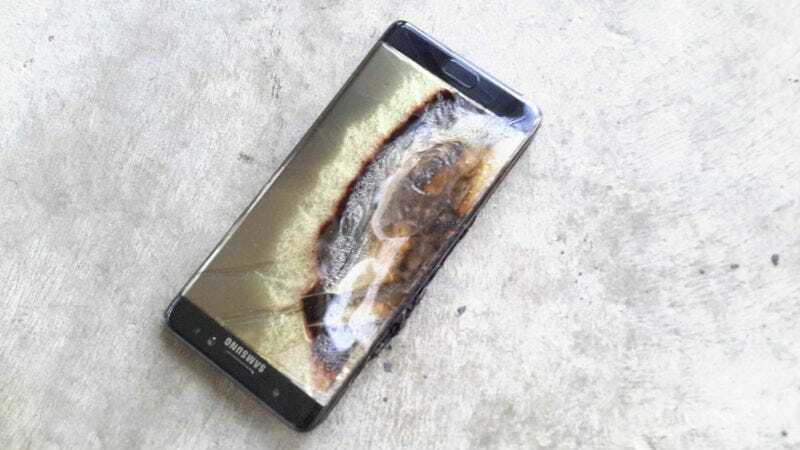 After phones that were supposed to be “fixed” also started to catch on fire, Samsung expanded its federal recall to include all Note 7 devices and permanently ended production of the phone. The Galaxy Note 7 used two different battery manufacturers that Samsung simply referred to as “battery A” and “battery B.” Battery A was in the first group of recalled phones (before September) and battery B was for the second group of phones that exploded after the first recall. The problem with battery B is a little different. The experts say there wasn’t a problem with the battery design itself, instead Exponent said the problem was determined to be “internal cell faulting between positive electrode tab welding defects and the copper foil of the negative electrode directly opposite the defective welds.” Those welding defects happened in the manufacturing process. Samsung blames the flaws on the fact that its factories were trying to get production started too quickly to counteract lost sales. This more or less matches what The Wall Street Journal reported last week. It also echoes an earlier report from a startup called Instrumental, which determined that the pouch for the Note 7's battery was too small based on its own teardown of a unit sold before the first recall. Now what? It’s great that Samsung and its third-party experts can explain why the batteries caught on fire, but the real test will be whether consumers will trust Samsung to not make these sorts of mistakes in the future. For me, the more egregious problem is actually the second battery, because its flaws were not born out of a design problem, but shoddy manufacturing standards when the company was in a rush to get products back on the market. Look, I get it, Samsung was in a bad situation after the first recall. It had a very popular phone that was not available for sale, plenty of angry customers who wanted a fixed phone, and a brand new iPhone 7 on the market to compete against. But that rush to getting production back up and running meant that corners were cut and that phones wound up exploding on airplanes. When the Galaxy S8 is introduced early this year, Samsung will need to do a solid job convincing the public that not only has it learned its lessons from a design perspective—but that it is prioritizing safety in manufacturing over the almighty dollar.